Many decaf drinkers miss the taste of “real” coffee. 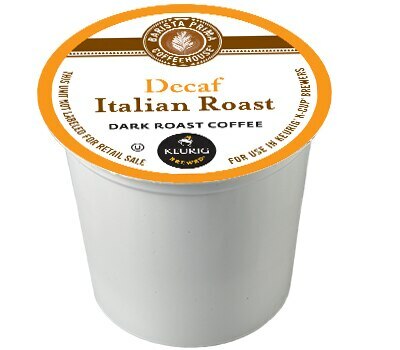 Luckily, these decaf Italian Roast K-Cups from Barista Prima Coffeehouse have a satisfying, full-bodied flavor gratifying enough to fool even the most nostalgic decaf drinker into feeling they’re sipping the real McCoy. Made from high-quality Arabica beans, this dark roast has a pleasant aroma and a smoky flavor that’s bold without being bitter. K-Cups are portion packs that are used with Keurig or other single-serve brewing systems to brew hot beverages. They brew in less than a minute and keep mess to a minimum, but you do have to invest in a single-serve machine and the price of the cups can add up. However, for those who crave a full-flavored decaf, the investment just might be worth it.